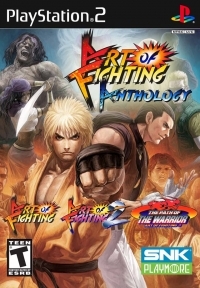 Description: This is a compilation of the three games in the Art of Fighting series: Art of Fighting, Art of Fighting 2, Art of Fighting 3: The Path of The Warrior. This compilation also includes a color edit mode and arranged music scores for all three games. 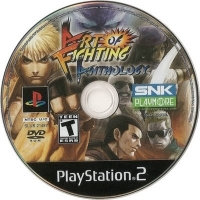 Box Text: Art Of Fighting Anthology brings together all 3 of the popular Art Of Fighting games, for epic one-on-one fighting action. Face off against the world's best martial artists in best two out of three matches. Use punches, kick and Super Attacks to take out colorful and dangerous opponenets. 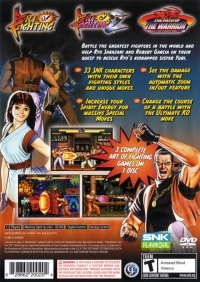 While doing this, you'll also open up the story of crooked cops and bloodthristy killers that sets the stage for the later "Fatal Fury" games. This is a list of VGCollect users who have Art of Fighting Anthology in their Collection. This is a list of VGCollect users who have Art of Fighting Anthology in their Sell List. This is a list of VGCollect users who have Art of Fighting Anthology in their Wish List.